Remember the days when a traveler’s notebook was all that was needed when traveling? A high-quality Moleskin to use as a travel journal. Well, in today’s world a travel notebook is taking on a whole new meaning. Now, it means a laptop. For anyone in the market for a new laptop for travel, this is the ultimate guide to the best laptop for travelers. After all, we travel professionally, and we don’t leave home without our travel laptop! We can provide advice on the best laptop for a traveling professional, as well as just an everyday traveler. We have experience traveling with great laptops, and not so great laptops. We’ve traveled with Asus, Dell, and an Acer laptop, as well as with MacBooks. We certainly have experience with respect to which laptop to buy for travel. 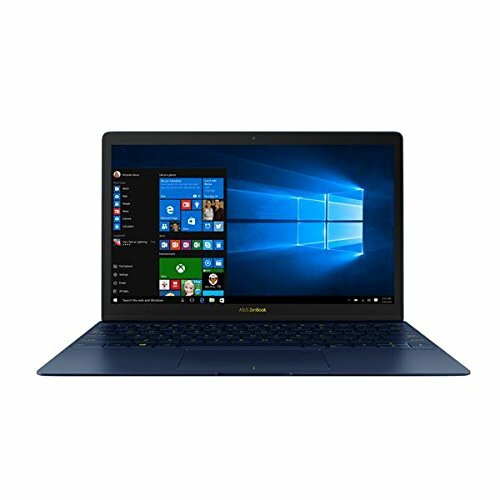 Now, I might not be able to say which is the best laptop to buy for you. But, I will offer tips and advice on how to choose a laptop, as well as laptop recommendations to guide any traveler into purchasing the best portable laptop for their journey. So, What IS The Best Laptop Backpack for Travel? FAQs – Travel Laptop Computers – What Laptop Should I Buy? We offer an in-depth review and buying guide for the best travel laptops for sale in 2019 below. But, if you don’t have time to read this entire laptop buying guide, this handy table allows you to compare laptops. It also provides easy links to purchase a new laptop online. It includes recommendations for the best small computer for travel, as well as a few more robust traveler laptop options. Each of these recommendations can be made using Amazon, and many can be purchased using Amazon Prime, meaning free and fast delivery. There are loads of lists out there focusing on the best notebook computers, either focusing on a specific price range, or size, for example. But when looking for the best travel notebook or best travel computer, the considerations are different. The best notebook for gaming at home is not going to be the right one for someone who travels throughout the year or someone who is looking to take a year off to travel. In this case, the best laptop for most people isn’t enough. You need to take into consideration your own needs. Here are some of the considerations when looking at some of the best laptop models for travel. When using a laptop for travel, this is probably one of the biggest concerns. Obviously, you want a lightweight laptop, one that does not drag you down when moving from one place to another. As a result, some of the best thin laptops might make sense. A slim laptop tends to weigh less, and overall will take up less space in a laptop backpack. That said, the best laptop size for travel also depends on the age of the traveler. We can’t travel with super small laptops anymore. It’s just not good for our aging eyes. For us, the best laptops for travel walk the fine line of being thin and lightweight, but with a screen big enough that we don’t go blind. The best notebook for travel is often one that has very good battery life. If the goal is to use the laptop to write, or to watch movies, on long plane rides, or even longer train rides, then good battery life is important. Although more modern airplanes, and even some trains in Europe, are starting to offer outlets at every seat, this cannot always be relied upon. It’s important to be able to get through the day without needing to charge up the travel laptop. Obviously, the laptop cost is super important, but the best laptop might not be the most expensive. And the converse is also true. When looking for the best traveling laptop, it might be tempting to just purchase one of the many cheap laptops on the market, but there are good laptops at every price point. Just because it is the cheapest laptop on the market doesn’t mean it’s a garbage laptop. But, sometimes it’s worth it to invest a little more to ensure the laptop is the right one for the trip. Included in our buying guide are laptops for under $500. Buying a less expensive product might give you some piece of mind and be the best laptop for a traveler. That way, you are not worrying all the time about carrying an expensive laptop. Many laptop reviews will say that MacBooks are the best on the market. But, when purchasing a computer for travel, it might help to start with whether you are in the market for a Mac product, or a PC product. Yes, some of the top PC laptops for travel will be less expensive than a MacBook, but if you are a Mac user, do you want to spend your travels learning how to use a PC? Below we include some alternatives for Mac users who are not ready to go back to a PC. When answering the question what is the best laptop to buy for travel, it’s not all about size and price – although those are important. Sometimes, it’s about functionality. Is the goal just to email, research, and watch movies? Or, is the goal to take, store, and edit photos? Or edit travel videos? That type of functionality requires a heftier laptop, both in terms price and in some cases, size. Looking for the best laptop for traveling because you are thinking about starting a travel blog? In addition to the specs listed above, there are some other considerations before purchasing a new laptop for travel. Before diving into computer specs, it’s important to consider why you are looking for a travel laptop in the first place. First, are you looking for a laptop for just travel, or the best laptop for travel and work? If it’s the latter, and you buy the best laptop in the world for travel, one that is small and lightweight, then is it going to fulfill your needs at home. Let me tell you a story. We traveled for a year in 2009. That was a long time ago, before tablets and smartphones. We traveled with a portable laptop, but it definitely wasn’t the best for travel. It was heavy, slow, and subject to viruses. Mostly, it was heavy. When we returned to the US, we knew we would continue to travel. I researched the best mini laptop so that we wouldn’t get stuck lugging around a heavy laptop again. But, that compact laptop was so small that when I used it at home I could barely see the screen. I realized I needed something that was a happy compromise. Even now, I need a laptop that can be used for travel, and work combined. Second, where are you traveling, and for how long? This is important to consider. If a travel itinerary is taking you to Southeast Asia, Africa, or Central America, or taking you to hostels and budget accommodations, do you want to worry about bringing a $2000 high-end laptop with you? There is something to be said for choosing a less expensive ultraportable laptop on the road. I originally published this post in 2018, but since that time we keep getting the same questions from our readers: What’s the best travel laptop for a blogger or digital nomad? Now, this is the real question and one that doesn’t apply to any “normal” traveler. But, some of the top rated laptops are top laptops for reason – particularly when the goal is to build a business on the road. In this case, I have to recommend a MacBook product. When your computer is your livelihood, and you don’t have the benefit of an IT support team, like a regular business traveler, the MacBooks just do it all, well and reliably. I include a full MacBook review below, but both Eric and I carry MacBooks and have since we left the US in 2012. They are more expensive than many of the more value-priced PCs, but I feel a lot better on a Mac than a PC. They are less subject to viruses. They don’t need to be rebooted or shut-down making them easy for travel on the road. We’ve been able to take them in for servicing at authorized Apple shops around the world too. They pack a lot of processing power as well. To me, they are the best laptop to travel with, hands down. Included below are some of the best notebooks for travel. Our reviews are organized by size, starting first with a mini laptop, which is more likely to be a 10-inch laptop. Then we move onto small laptops. A small notebook seems to be most common for travel. But, sometimes the best notebooks for travel are slightly larger, so we include laptop recommendations in the 14-inch to 15-inch laptop sizes as well. For most people, the best laptop for the money will fall somewhere in the middle. It’s the Goldilocks phenomenon. The best laptop computer for travel is not too big, and not too small, and not too cheap, and not too expensive – it’s just right! Often times people think the best lightweight laptop is the best laptop for travelers. And, in some cases, they are right. Some of these small laptops for sales are hybrids, acting as both a small laptop computer and a tablet. Others are more like traditional laptops. One of the biggest benefits here includes the notebook laptop price, which tends to be lower than larger or more sophisticated laptops. This can make them great for travel. But, remember, a 10 or 11 inch laptop is small. This might be a problem for older travelers (me included), which means that the best laptop to buy might be one that is slightly larger in size. This 10-inch laptop packs a punch and is one of the best-rated laptops on Amazon. 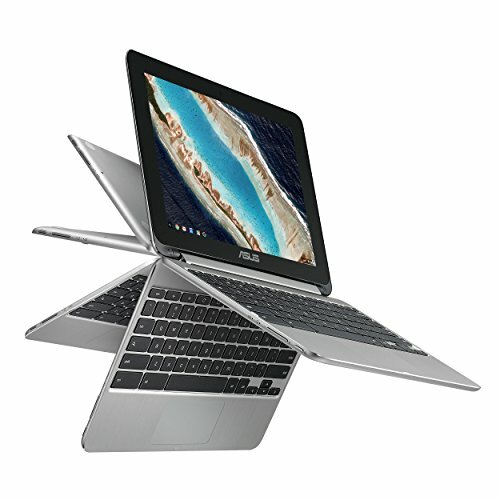 The Asus Chromebook Flip can be used as a tablet or as a laptop, making it super flexible for travel. It’s also super lightweight, at only 2 pounds. And, it’s one of the best thin laptops, at only .6 inches thick. The battery lasts up to 9 hours. This is one of the pretty cool laptops on the market. 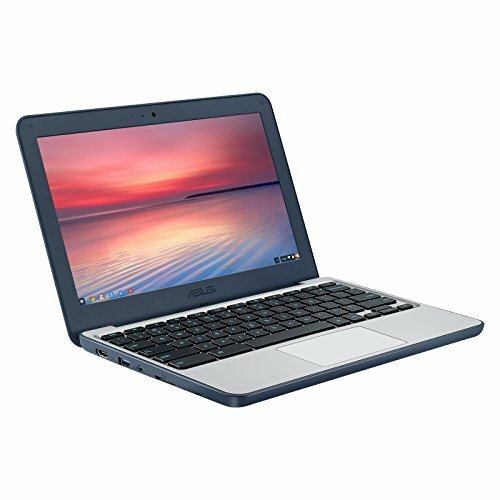 It is a Chromebook. That means it runs on the Chrome operating system (i.e. it’s not a PC or a Mac). Even though the laptop operates on a Google platform, it can be used online or offline, although periodic internet connection is required to keep the operating system up to date. It’s possible to keep your most important files local, but have access to over 100GB of Google Drive storage for all files. Pro: Super light and super thin, and with an all-metal body, so it’s pretty rugged. Con: The Chromebook itself only has 32GB of storage, the rest is in the “cloud.” If heading somewhere with limited internet access, this might limit the ability to keep files like photos, videos, or movies locally. Another great Chromebook from Asus. Because it’s a Chrome book it operates similarly to the one above. The difference here is that the ASUS Ruggedized Chromebook stands up to travel (and kids) because it has a more rugged design (it survives dropping) and it has a water resistant keyboard (it survives spills). The display is 11.6 inches, making it slightly bigger than the other Asus Chromebook, but that also means it is slightly heavier, at 2.65 pounds. But, it’s a great travel laptop with long battery life and lightweight, even at this weight. Pro: Water resistance! I wouldn’t suggest taking it in the pool, but it should stand up to simple spills, which happen all the time. It’s one of the most durable laptops at this price. Con: It suffers the same problem as all Chromebooks, offline storage. 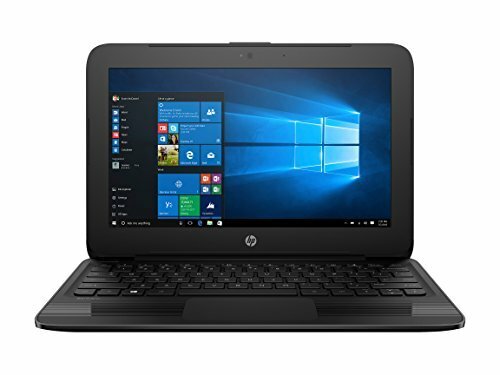 The HP Lightweight Stream Pro is a more traditional travel laptop, in that it is a PC laptop instead of a Chromebook. This means that there is more internal storage, at 64GB. That means more storage for movies and music than the Chromebooks provide. It also has storage slots for Micro SD cards, which means you can easily transfer photos from a travel camera. Even with this extra storage, it only weighs 2.59 pounds. That makes it one of the best everyday laptop options at this price. Pro: One of the top Windows laptops at this price that is good for travel, and it has more storage than the Chromebooks. Con: As are many small lightweight laptops, it’s pretty simple, and it’s not necessarily the most stylish if that’s an issue. Back to the Goldilocks theory, sometimes I feel that a 13 inch laptop is the right one for travel. It’s not too big, so it’s easy to carry around. It’s not too small, so it’s still possible to read the screen, particularly for older eyes. Because it’s slightly bigger, it usually has more storage and operates faster. Maybe I’m biased because I currently travel with a laptop that could be the best 13 inch laptop (yes, okay, I’m biased). Because sometimes the best small laptops for travelers are not always the ones that are the smallest on the market. The ASUS ZenBook 3 12.5-inch Ultra-Slim Core i7 Lightweight Laptop is a mega improvement from the ultraportable travel tablet laptop hybrids above. But, this functionality comes with a price. Yes, it’s more expensive, but it also offers 256GB of storage. First, it’s meant to be rugged, with Gorilla glass, and built-in fingerprint sensor for increased security. Second, it’s made from aerospace-grade aluminum (seriously) which is why it is so lightweight, and less than a half an inch thin. Third, well, it kind of looks pretty cool. Pro: A special cooling system makes it great for warm weather, super lightweight, and a lot of storage. Con: More expensive than other Asus computers, but would be more flexible to use both home and on the road. This is where the differences between the best mid range laptop on the market and the ultra-portable, less expensive models, becomes quite stark. This Dell Inspiron FHD Touch is a lot more expensive than the lightweight Chromebook mini laptops for sale above. But, this 13.3 laptop packs a lot in. Most notably, it offers 256GB of storage, meaning it would work way better to store pictures, videos, or movies when traveling. It’s like the transformer of laptops because it can convert into a tablet, as well as be placed in stand position to watch movies or tent position to read. 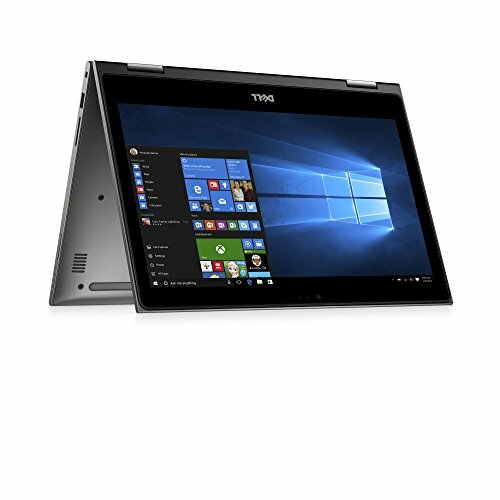 It’s rated as one of the best laptop tablet hybrid computers. The battery lasts over 7 hours as well. Pro: This small powerful laptop can stand up to almost 150 degrees, making it perfect for traveling to hot climates. Con: It’s 3.56 pounds, certainly taking it out of the running for an ultralight laptop. But, considering my first Dell computer was about 7 or 8 pounds, this still isn’t bad. This 13″ MacBook Pro with Retina Display is similar to the travel laptop I use. But, remember, I use mine for travel and work, and I am on it all day every day. So, mine is actually a beefier version of this one, in that it has 512GB of storage (photos and videos), and an increased processor (video production). My laptop is probably more than what anyone needs from a travel laptop that doesn’t also work double duty as one of the best business laptops out there. Macbooks, in general, are the best laptop for traveling blogging and also the best digital nomad laptop, because it can handle work efficiently. All that said, I do love my MacBooks. Eric has a MacBook Air, and I had an Air before my MacBook Pro. Unfortunately, they no longer make a MacBook Air with the storage I need. Pro: One of the most secure laptop options, which rarely, if ever, is subject to viruses. It’s super fast, does everything I need, and talks to iPhones and iPads with no disruption. If you are an Apple user, this is a great option. Con: Weight. At 4.9 pounds, this is no ultraportable laptop. Or, try this 12 inch MacBook, which is only 3.9 pounds! One of the main reasons travelers might prefer a slightly larger laptop is the screen size is bigger. This is not only beneficial to older travelers (including me) who struggle with a smaller screen but think about how travelers tend to use travel laptops. Not only are they accessing the internet and checking email, but a lot of times they become entertainment devices. One of the things we learned about traveling as a couple is that: 1) we each needed our own device; and 3) we watch a lot of TV and movies on our laptop when traveling. These larger screens help, so long as the weight can be kept manageable. That’s why some of these can be on lists of the best performance laptop. The Acer Swift 3 could win for the best 14 inch laptop for travel. Although heavier than some of the other travel laptops, weighing in at 3.75 pounds, it’s a best all-around laptop that can be used for travel, and at home. It also hosts one of the longest battery lives in our buying guide, with up to 10 hours of battery life, which is pretty great. Pro: It’s ultra-thin, all-metal, and made for traveling. 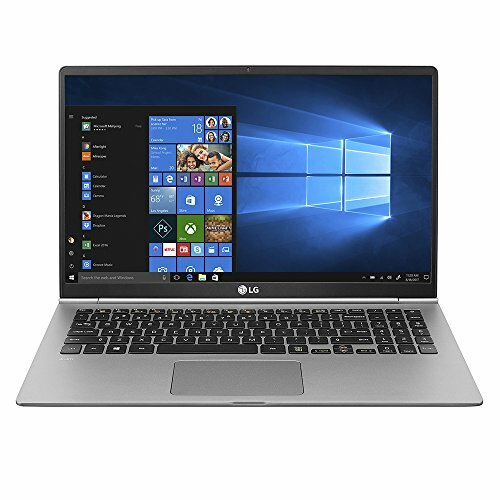 The LG Gram Thin and Light Laptopcan be considered the best 15 inch laptop on the market right now for travelers. And, it might be considered the best light laptop for travelers, weighing in at less than 2.5 pounds. This puts it on par with some of the tablet notebooks above. It has a long lasting battery, a pretty powerful speaker for watching movies, and 256GB of storage. Pro: One of the best-rated laptops at this price and this size, hands down. Con: Not as rugged as some of the other laptops, like the all-metal ones, meaning it’s a little more delicate. Now, here is where I might get a little controversial. Anytime you travel with a computer, of course, you want to keep it safe and sound. And, many travelers might be searching for the best laptop backpack for travel to make this happen. I am going to make a recommendation for one of the best laptop travel backpack products out there. Eventually. But, neither Eric nor I have ever carried a traditional laptop backpack, even though we’ve been traveling with computers forever. For us, the best laptop bag for travel is one that does not scream “I’m carrying an expensive laptop! Please steal me!” We liked to be more covert. Eric has carried the same Timbuk2 Classic Messenger Bag since 2012. It’s held up (albeit a little dirty), and Eric refuses to get a new one. The large bag has a slot in the bag that holds up to a 15 inch laptop. This is the only travel laptop bag he needs. And if you ask him it’s the best travel laptop bag. Period. I, on the other hand, try to at least appear more feminine, and professional, when I travel. Generally, I use a Neoprene Laptop Sleeve to protect my MacBook, and slide it into my travel bag. These bags have included my favorite travel backpack, the Anello Lightweight Rucksack, which is lightweight and still fashionable. I use this as a carry-on bag, and it fits my laptop, cords, a sweater, wallet, water bottle and more. It keeps my travel laptop safe discretely. I’ve also used a Laptop Sleeve inside my Michael Kors Leather Tote Bag. This is less practical, and heavier. But, I use this more for business and professional travel. More recently, I’ve carried my laptop even in my Desigual Hand Bag. 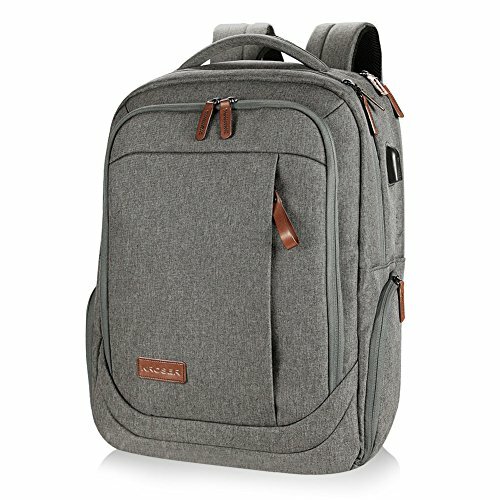 If wedded to finding the best computer backpack for travel, then I do want to offer a recommendation. I understand many people want to travel with a laptop bag that is more practical, with storage for all sorts of accessories and plugs that go along with a travel laptop. But, for safety purposes when traveling, please avoid using a bag from the computer manufacturer. Please don’t carry a travel backpack that says “Dell” or “HP” on it. Try to be more discrete. This KROSER Laptop Backpack is one of the best computer backpack products available on Amazon. It’s sleek and contemporary looking. It is water repellant, making it great for travel. This backpack can be used by women and men. And, it’s pretty darn functional, with loads of pockets and a USB charging port. Is a MacBook the best computer for travel? 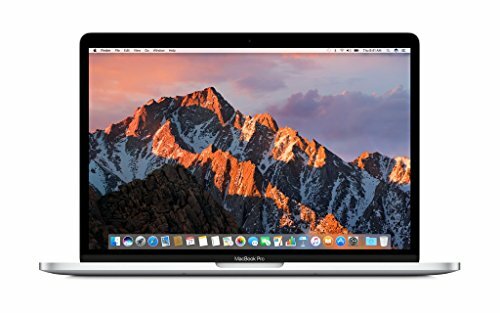 There’s no denying that Apple is one of the best laptop brands, and makes some of the best computer products out there. But, that quality comes with a cost. Our MacBooks have always been some of the fastest laptop brands we’ve owned. But they also stand on the top of the laptop price list, as we showed above. Yes, I love the MacBook products. That said, there are more affordable laptops for folks looking to travel with a laptop. 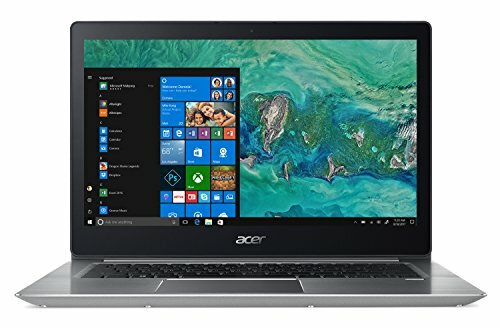 What are the best laptop brands? Obviously, I’m partial to Apple products. At the same time, I spent years working as an attorney where one of my biggest clients was Dell. Getting that out of the way, some of the top laptop brands include HP, Asus, and Acer, along with Dell and Apple. Yes, there are other laptop brands, but some of them are not really name brands. When it comes to purchasing a reliable travel laptop, it’s important to choose a top laptop brand.